HOLLYWOOD, California -- Los Angeles police on Monday arrested a man for trespassing and altering the Hollywood sign to read "Hollyweed" on New Year's Day. Zachary Cole Fernandez, 30, voluntarily surrendered to Hollywood detectives with his attorney at his side, according to a press release from the LAPD. Fernandez was arrested and booked for trespassing. He is scheduled to appear in court on Feb. 15. The suspect targeted the sign at about 3 a.m. New Year's Day, according to Los Angeles police, and scaled Mount Lee, made his way over a fence and then climbed onto each of the landmark's "O" letters. He then draped those letters with black tarps so they each appeared as a lowercase "e."
As bemused tourists looked on from a nearby vantage point, park rangers removed the tarps and restored the proper text's visibility by midday. Following the prank, officials announced they would increase security measures around the landmark. Chris Baumgart, the president of the Hollywood Sign Trust, said in a statement additional surveillance in the area will be in place. "The Hollywood Sign surveillance system is constantly evolving, but an incident like the one that occurred early Sunday morning shows us where there are opportunities to make improvements. The New Year's prank was no exception and we will be deploying additional technology to tighten up surveillance, thus deter unwanted visitors in the future. This is more than preventing pranks or trespassing at the sign. Our concern is the safety of the neighborhood and the trespassers that put themselves at risk because it is extremely unsafe to be on the sign, let alone traversing the treacherous hillside that is home to those nine famous letters." The scandal wasn't the first time the landmark had been targeted. 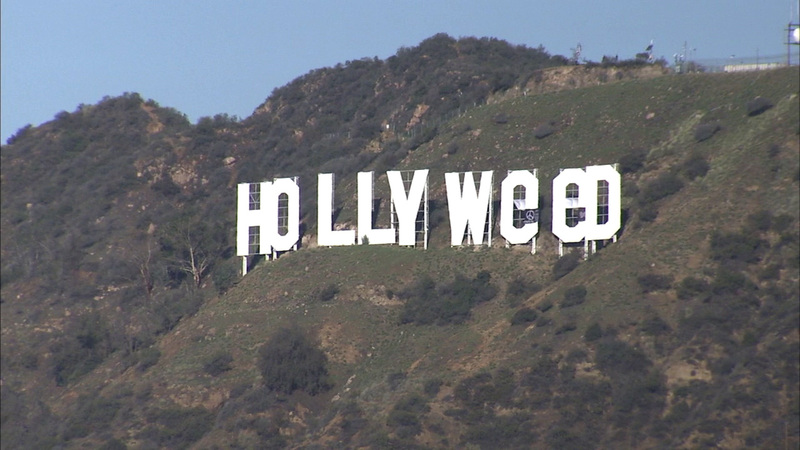 According to the online newsletter The Cannabist, the sign was similarly edited to read "Hollyweed" in 1976. The lettering was also changed 10 years later as part of a publicity campaign for a movie.